bluegrass innovators Lester Flatt and Earl Scruggs. 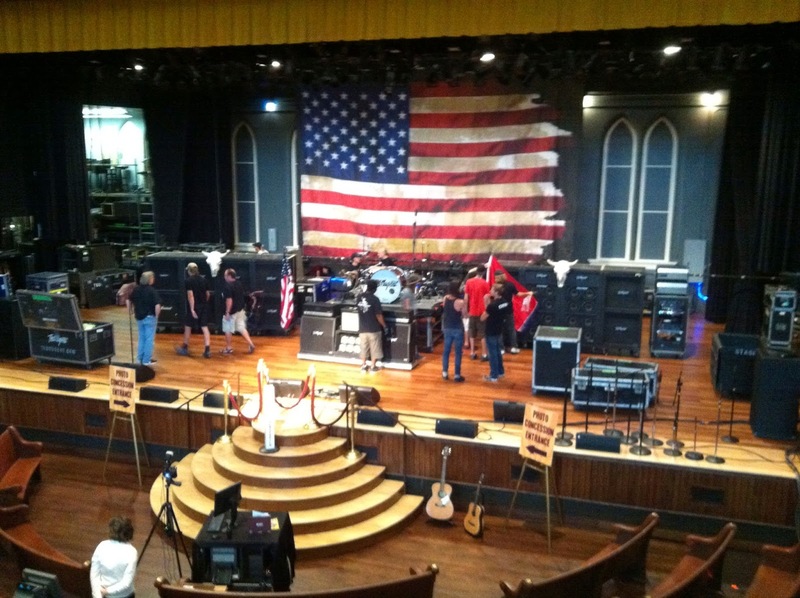 The Ryman became famous in its own right. 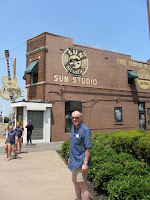 Back in the Sixties the place was bought by National Life Insurance, the owners of WSM Radio, which in turn owned the Opry (it’s a radio show, remember). A few years later they decided to build a modern, new home for the Opry. They continued to own the Ryman though, and classy bunch that they were, after the Opry moved out they seemed prepared to have it demolished. For years it was used only sporadically, until new owners refurbished it and reopened it in the Nineties as a signature performance venue. Nowadays it hosts rock bands as much as country – including, during our stay, none other than the Motor City Madman himself, Ted Nugent! One of the drivers behind the move of the Opry to a new venue was apparently the grim backstage conditions, with cramped dressing rooms and no air conditioning. Not that this bothered the likes of Kris Kristofferson too much. The story goes that he used to spend his time having a few beers in one of the bars out back of the Ryman on Broadway, before dashing to the stage when he was called. Broadway is one of those places where there is music on tap from morning till midnight, and beyond, supplied by bands playing covers for tips in a host of bars such as Legends, Tootsie’s and Second Fiddle to name but a few. Sure, it can seem a bit strange ducking out of the bright sunshine to spend the afternoon boozing in the company of, say, Lefty and the Right Hand Band. But if you prefer you can always have a long lunch al fresco in the rooftop restaurant of Rippy’s BBQ &Grill, listening to a few guys with acoustic guitars taking it in turns to ply their trade. It’s pot luck whether a particular bar has a band that takes your fancy, and enough punters have camped out there to create a decent atmosphere. So you just have to take your chances. But a good outfit, like Lefty and co, will keep you entertained playing all sorts of requests, and for blues or rock’n’roll as well as country. They’ll also engage in dialogue, generally wanting to know “where y’all from”, which then becomes your monicker for the duration – so we were ‘Scotland’. You might have to be patient though. In the evening we set off looking for a bluegrass session Jill had seen advertised at the tourist office, but couldn’t find the place. This led to a bit of fruitless wandering before we eventually pitched up at Robert’s Western Warehouse shortly before 10pm, just in time for an entertaining three piece with stand up bass to finish their set. Fed up of drifting, we decided to sit it out till the next outfit to start their slot – and half an hour later were treated to the truly brilliant Don Kelley Band. Okay, so they were another covers band. But boy did they know how to entertain. Cowboy hats, excellent musicianship and a nice line in ironic self-congratulation kept us there until the wee hours. Plus, they featured the jaw-dropping guitar picking of Porter McClister. Honest – check out this rendition of ‘Truck Driving Man’! Bands like this make it well worth checking out Roberts. The Voodoo Rooms is packed again for tonight’s gig. If it keeps going like this, the Edinburgh Blues Club is going to need a bigger venue. Due to circumstances beyond my control I’m late arriving, so I’m only just in time to catch the last song from Lights Out By Nine. Sorry to have missed you gents, but I can say that you cooked up a storm on ‘Digging On James Brown’, and I liked the sound of the horns! Gerry Jablonski and the Electric Band kick off the second half of the night with ‘Higher They Climb’, launch pad for an eclectic set that dots around slow blues, R&B, blues rock and here and there straightahead hard rock. Bandleader Gerry Jablonski on guitar and vocals is an energetic little guy, prone to sudden charges across the stage to wig out in the far corner, and abracadabra gesticulations as he plays guitar. But he’s at his best when he reins himself in for bluesier moments, such as his slide intro, redolent of Micky Moody, on the stomping ‘Ain’t Gonna Work No More’, and the Gary Moore-ish slowie ‘Blues Gonna Bring You Down’. The latter, taken from their out-any-day-now new album, also features a wild harp solo from Pete Narojczyk that draws spontaneous cheers from the crowd. The interplay between Jablonski and Narojczyk is one of the strengths in the band’s approach, and something of a unique selling point. But it also has to be said that the harmonica player is a magnetic performer in his own right, bristling with such intensity that he grabs your attention throughout. Imagine the Russell Crowe character from LA Confidential taking some time off from beating up suspects and lusting after Kim Basinger to let off some steam by blowing some harp in a downtown bar, and you might start to get the picture! Rhythm section Lewis Fraser on drums, and Grigor Leslie on bass, underpin the front men with subtlety and feeling. Leslie in particular brings some roll to the rock, as it were, while Fraser adds some nice harmonies for good measure. They’re a band who write good material too, such as the funky ‘The Dance’ and the good time set closer ‘Slave To The Rhythm’. If they can focus their writing even more on their strengths, there could be a whole lot more potential for Gerry Jablonski and the Electric Band to mine. Now here's a thing. Listening to his just released live album One Night InAmsterdam, you could be forgiven for thinking that Ian Siegal is content to delegate the limelight to hot shot guitar sidekick Dusty Ciggaar. Well, anyone catching Mr Siegal on his current UK tour with Ciggaar and his Rhythm Chief pals will realise this is far from the truth. Let there be no doubt, in the flesh the main man is Ian Siegal. This isn't to damn Ciggaar and co with faint praise, because they do some heavy lifting. But essentially Siegal is a modern day itinerant troubadour, disseminating songs that resonate with him, whether his own material or that of others, sometimes culled from across generations. And while his band may be fellow conspirators in that project, it's evident that Siegal is the driving and guiding force. Part of that troubadour mentality, I think, is an interest in the words as much as the music. There's no doubt that Siegal is a student of musical styles, ranging across blues, country, folk, gospel and god knows what else. But he also trades in stories, characters, dramatic monologues, paradox and metaphor. All of these Siegal may conjure for himself, or conscript from others, interpreting them with a remarkable, gravel-laden voice, which he can bend to the styles of Howlin' Wolf, Tom Waits and others at will. Tonight's set in Newcastle is based around the live album, but some of the highlights come in songs that don't feature on that release, such as 'Revelator (John The Apostle)', into which he inserts a chunk of the Wolf's 'Back Door Man'. This follows on from the excellent hill country blues of 'She's Got The Devil In Her', dedicated to Mississippi bluesman Robert Belfour, who Siegal knew personally (“we drank moonshine together”) and who died last month. These songs rather give the lie to Siegal’s contention that “we’re not really a blues band”, but of course the set does range more widely. ‘Gallo Del Cielo’, now in an electric incarnation, features Ciggaar making use of a baritone guitar (my muso pal confidently tells me) to lend a suitably Hispanic tone to his two solos. His boss, meanwhile, delivers some tasty slide on ‘Early Grace’, and funks up ‘Hard Pressed’ to great effect. Not to be outdone, young Dusty saves possibly his most blistering solo for the final encore, ‘Take A Walk In The Wilderness’. As a climax to the show this is more than just a guitar solo however. Dedicated it to its writer and another of Siegal’s friends, the late Glaswegian ‘Big George’ Watt, its gorgeously yearning chorus epitomises the spirit that imbues Siegal’s work, both live and on record. I only have one question: why is this man playing in such small venues? As great as it is for punters like me to see him play in such intimate surroundings, he deserves to be heard by a much bigger audience. So you’re having a party in the house, and this brickie turns up along with some other mates. Looks like he’s had a couple of liveners, but just enough to enjoy the craic. He’s barely in the door when he spots something in a corner of your living room. “Hey, that a guitar? Ya beezer!” He picks it up - and proceeds to bring the house down. Okay folks, I plead guilty; it’s a shocking stereotype. Alan Nimmo is a big burly guy, but I know diddlysquat about him personally - he could be teetotal and not know one end of a brick from the other for all I know. And King King are not just Alan Nimmo’s sidemen, they are very much a band, all four of them contributing to a magnificent sound, and now sharing equally in songwriting credits. But let me explain. and keyboard player Bob Fridzema. Stage left, Lindsay Coulson on bass is Mr Cool in smart jacket and shades, swaying to the rhythm. But centre stage is Alan Nimmo, in a t-shirt and his trademark kilt, visually very much the cutting edge of their line-up as he kicks in with an effortless blend of rhythm and lead guitar, and his warm, Paul Carrack-like vocals – the latter complemented, it has to be said, by excellent harmonies from Fridzema and Proctor. As a front man, moreover, Nimmo is engaging, down to earth and humorous, without ever making a big deal out of it. Their set draws on both their first two albums, and also includes a few new songs from their soon-here third album, Reaching For The Light. But this isn’t going to be a blow by blow account of the show, save to say that ‘Long History Of Love’ lives up to expectations as one of my absolute favourite songs of recent years, and the new material fits in seamlessly. What is most marked about King King is the groove that they develop. Individual songs may be great but, whether they are originals or covers, in a way that’s not the point. Collectively they serve something bigger – a sound that is earthy, soulful, and full of dynamics. In the live setting of a hometown gig the audience interaction introduces an extra current of electricity, but you can still lose yourself in the feeling when now and then they fashion a rolling, repeated refrain that Nimmo weaves his way around vocally and on guitar. Tonight there is a homecoming bonus as Stevie Nimmo takes to the stage to trade guitar and vocal spots with his younger brother on the closing numbers, capping the main set with the excellent ‘Old Love’. As intimate as the ABC2 is, King King should be playing bigger halls than its 350 capacity, because more people deserve to enjoy their performance. Sooner rather than later, hopefully. Just friends you haven't met yet, as the Irish proverb has it. If the statistics I’m looking at aren’t damned lies, a few folk seem to have found their way here to cast an eye over my musings in recent months. It occurs to me that maybe I should have styled myself 'Rambling Man', given the style of some of the entries in this blog, but I hope you've found something that made the trip worth a few minutes of your time. So, welcome (back) my friends to the show that never ends, and all that. And if you have any thoughts in response to my reflections, then don't be shy - feel free to leave a comment. Maybe you agree with something, maybe you disagree. Maybe I've reminded you of another band or another album that you'd like to mention. Whatever it might be, go ahead and chip in. After all, music is for sharing! Jo Harman doesn’t just take to the stage – she takes the stage. Not having seen her live before, I was well prepared for a great singer, but the overall performance comes as a pleasant surprise. Right from the start she is a commanding, full on presence – aided and abetted, perhaps, by the fact that most of her band are short arses! But whatever they lack in stature, they make up for in quality, providing Harman with a platform from which she can shine. And shine she does, demonstrating her vocal talents in a range of styles, from the delicate ballads like ‘(This Is My) Amnesty’ that are almost her trademark, sung with feeling and subtlety; to the Motown-ish soul vibe of ‘When We Were Young’, decorated by smooth harmonies from the band; and the up-tempo, driving ‘Through The Night’, on which she lets herself go during the towering climax powered by Stevie Watts’ keys. Indeed one reason Harman remains a focal point throughout is that she visibly enjoys the contributions from her band members, interacting with them well on ‘Ain’t No Love In The Heart Of The City’, even if she slightly over-eggs the ending. ‘Cold Heart’ though, which she rightly describes as the centrepiece of her debut album, beautifully balances fragility with passion. Harman has to call a sudden halt during the intro of ‘Bless My Soul’, when she spots an audience member collapsing at the front of the stage. The room is cleared while the punter gets medical attention, and thankfully comes round. Naturally, it’s an awkward moment, but after the enforced hiatus she and the band regroup, guitarist Nat Martin leading the way with a big solo on ‘Sideways’. A driving final segment includes the excellent ‘Underneath The River’, and a cover of Free’s ‘Ride With A Pony’ as a tribute to the late Andy Fraser, which Harman claims the band learned on the long drive to Edinburgh that day. And there’s still time for her to cement her soul credentials with an encore of the Isley Brothers’ ‘Work To Do’. It’s an impressive display all round, with the new songs and covers showing a broadening repertoire at her disposal. Plaudits too to Perthshire support band Wang Dang Delta, an engaging bunch of greybeards who demonstrate a well-honed groove on a set of their material, with a bluesified version of Christy Moore’s ‘Ride On’ as a pleasing added bonus. The interplay of guitar, keyboards and harmonica is smooth as silk, with deft touches of funk and swing. And you can only applaud a rocking tribute to the A9 entitled ‘Ca-ca-ca-ca-ca-ca-caravenette’.